Why Buy HubSpot From an Inbound Marketing Agency? Full disclosure: We love all things HubSpot and we work in it all day leveraging the many tools for our clients. From campaigns to work flows to reporting and everything in-between, we basically bleed orange around here. But, that doesn’t mean we don’t “get it” when companies don’t want or need ongoing monthly help from an outsourced inbound marketing agency like ours. But, if you’re looking to get HubSpot soon for your businesses marketing team, we’d like to be the one you simply buy it from - no agency retainer required after the purchase. Why? Because it’s better for you and it’s better for us. 1. A HubSpot specialist to help technical setup of the HubSpot tool plus 90 days of technical support. 2. Advice for CRM and other software or tools you need to be implemented. 3. Advice for developing your first inbound marketing campaign. 4. HubSpot support, training programs and access to the customer success team. When you work with an agency for the purchase of HubSpot, you get all of those things for free. The reason is, we already have access to all of those things, and we’ll give them to you just for making the purchase through us. And the best part about that is, you don’t have to pay that $3,000 fee. The reason? HubSpot knows that when an agency handles the implementation/onboarding, you’ll get everything you need from us and you won’t utilize their resources as much as you would without us, so it makes sense. (They just don’t advertise it.) And in case you're wondering, your software cost remains the same, too. 2. Advice for CRM and other software or tools you need implemented. It's exactly the same, just $3k less. It's a no-brainer in our opinion. And if you're shopping Marketo too, take a look at the chart below. 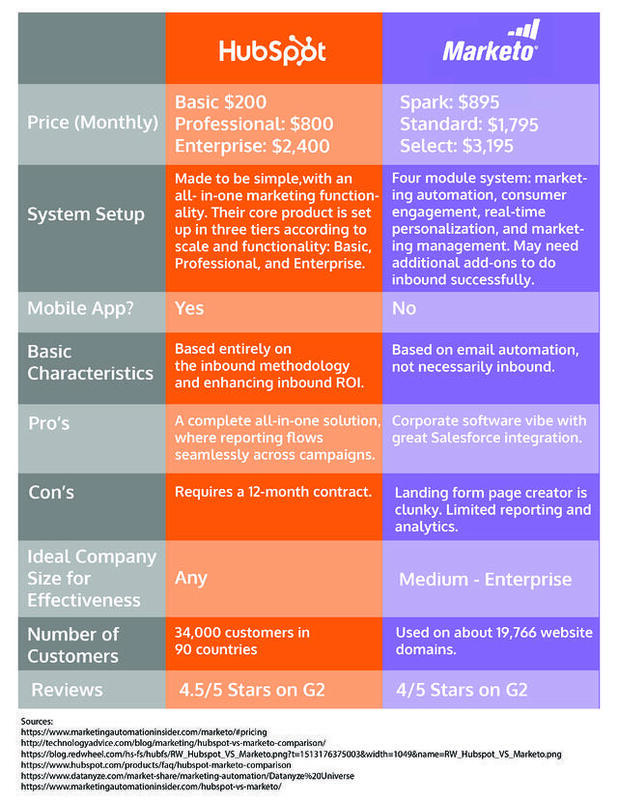 Not only does HubSpot deliver a more robust product, but it's less expensive, too. Our organization is much smaller than HubSpot. And honestly, as much as we love the folks over there when it comes to implementation, it's nice to avoid the corporate back-and-forth and with an agency like ours who knows you and your business as well as how you are using HubSpot. We’ll take care of all the implementation headache and serve as the resource you need while you get up and running. Our in-house team includes HubSpot-certified developers, Senior Inbound Marketing Consultants, and HubSpot-certified designers who are available to answer anything and everything HubSpot-related for you during the implementation process. Trust me, we’ll take good care of ya. Third Reason: You’re Helping Another Business Succeed, Too. Here’s the deal, HubSpot is making money whether you purchase the tool through them or not, but, when you purchase through us, you are helping a small business succeed, too. Selling HubSpot software is a key component of helping us get to that next (and highest) “Diamond” partner tier level with HubSpot, so when you purchase through us, it helps grow our presence and credibility within the HubSpot community. Yep, I know! I would buy it from us, too! So please, for the love of all that is right in the world, if you are going to purchase HubSpot for your business in 2018, give us a call. And we promise, no sales pitch on inbound retainers included (unless you ask for one, that is!). We’ll just get you set up and going with HubSpot, then we'll wish you all the best in the future with your inbound marketing efforts. Click below, fill out the form and we'll be in touch within 1 business day.